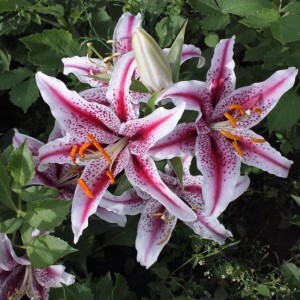 Lilies are ornamental and essential perennial bulbous plants of Liliáceae family. Plant has exclusive popularity among gardeners thanks to a variety of colorings and effective appearance. According to new classification of all lilies can be divided on some groups: Asian and East hybrids, Long-flowered hybrids, LA-hybrids, OT-hybrids, LO-hybrids, LP-hybrids, AA-hybrids, Martagon-hybrids, Kandidum-hybrids, American hybrids, Tubular hybrids. It should be noted that Asian and LA-hybrids have a bigger variety of color scale in coloring of the flowers.